There are some cosmic characters that are not necessarily in the Guardians of the Galaxy movie but they could make a short cameo or be mentioned briefly. The Nova corps member that gives Rich Rider his powers is in the Guardians of the Galaxy movie could Rich make an appearance as well? Moondragon is the daughter of Drax. I am not sure if the origin of Drax will be the same as in the comics but it is possible she could exist in the movie universe. Adam Warlock's cocoon can be seen in the Collector's warehouse. Could key member of the Infinity Watch appear in the Guardians of the Galaxy movie? Watch out for Adam Warlock! There are rumors of Mar-Vell showing up in Agent's of SHIELD. It is possible that he could show up or be mentioned in the movie. Ronan is a Kree alien and so is Mar-Vell. Watch out for Mar- Vell! In the comics Cosmo runs the space station Knowhere that will definitely appear in the Guardians of the Galaxy movie. Watch out for Cosmo the Space Dog! 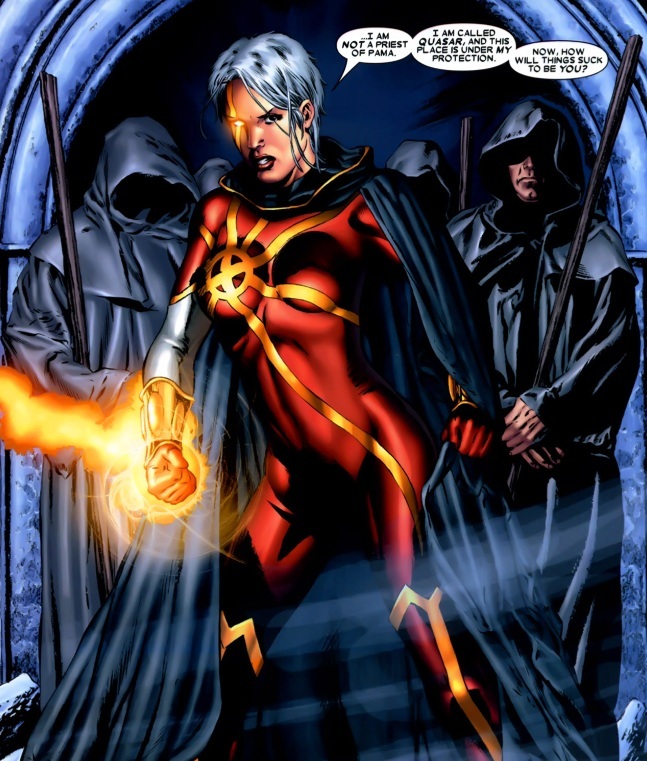 Phyla-Vell is the daughter of Mar-Vell if Mar-Vell appears then she may not be far behind. Mantis is one of the telepaths that joins the Guardians of the Galaxy. She has links to the Kree aliens as well which mean she could make an entrance. It has been rumored that Marvel is planning a Ms Marvel movie. If this is the case they could introduce Carol in an after credit scene or mention her in passing. Watch out for Carol Danver aka Ms Marvel!!!! A lot of what I am seeing in Agents of SHIELD seems like references to the Inhumans. Could they make an appearance or be mentioned in Guardians of the Galaxy? If they exist it seems likely that Ronan would know of their existence. James Gunn shot down the rumor of Guardians of the Galaxy sequel being made of elements of the planet Hulk story. That said there are Sakaarans in the movie. There are also what appear to be red skinned Imperial Sakaarans running around Xandar. There is also potentially a red skinned imperial in a cage in the Collector's warehouse. Could this be the Red King? Who knows how many Easter Eggs are in his warehouse.